The last part, when Mary speaks, is known as "The Magnificat." Today Danny Abramowicz is very active in the Catholic faith. He serves several Catholic organizations, including on the Board of EWTN, the Board of Directors of Catholic Foundation, the Executive Committee for Archbishops Annual Community Appeal, the National Catholic Men’s Fellowship, the President’s Council at St. Joseph’s Seminary College and the Director of the John Paul II Culture Center. This was not always the case, however. For quite a while, Abramowicz was very luke-warm about his faith. In Spiritual Workout of a Former Saint , Abramowicz tells of how he turned his spiritual life around. He had never completely abandoned his faith, but it was far down on his list of priorities. Football fans will recognize his name from his eight years playing for the New Orleans Saints and his long coaching career. Abramowicz was living in the fast lane and had become an alcoholic. As he states, “My conduct placed a tremendous strain on my marriage. I remember waking up in the morning with a hangover, telling my wife I was sorry, and promising her that I wouldn’t do it again. And lo and behold, sometimes I would be back at it the very next day. This behavior continued even after I retired from football. My wife was at her wit’s end with me. So she, along with some of her friends, began to pray that God would intervene in my life.” One morning, he woke up and decided he needed to talk to a priest. He began attending AA meetings in 1981. The way he words it, “God used [alcoholism] to get my attention.” He soon began attending a Bible study and began hosting a prayer group for men in his home. Abramowicz compares strengthening one’s spiritual life to strengthening one’s physical condition. He advocates getting the Holy Spirit as one’s personal trainer, scouting out the enemies of the spiritual life, stretching out in prayer, running away from temptation, receiving spiritual nutrition, and resting in the spirit. He offers concrete, practical ways to focus on each of these areas. While women will profit from reading the Spiritual Workout of a Former Saint , it was written by a man for men. It has been recommended by the National Fellowship of Catholic Men. At a time when fewer and fewer men are found in the pews on Sunday, it is sorely needed. It would make a wonderful gift for the men in your life. Anyone who has been grocery shopping lately knows that prices are going through the roof. As a result, food banks are getting hit especially hard. Not only do they have more people in need of their services, but their own costs are rising due to the increased cost of food and gas. Please, please, please, if you are at all able to do so, donate to your local food bank. I know it is hard when your own economic situation is taking a down-turn, but many of us are fortunate enough to still be able to put food on our tables. Let's help those who aren't so lucky. With the feast of Corpus Christi (the Body and Blood of Christ) now behind us, the liturgical year returns to what is known as “ordinary time.” This season will last until the new liturgical year begins with the first Sunday of Advent. A few years back, Phyllis Tickle wrote The Graces We Remember: Sacred Days of Ordinary Time . In it, she tells of the experiences she and her family shared during the summer and fall on the farm she and her husband owned. The point of “The Graces We Remember” was that ordinary time was anything but ordinary. It is interesting that the Gospel readings for ordinary time focus on the work of Jesus. In the weeks to come, we will hear of Jesus’ teaching and his miracles. We will see him instructing his followers and healing the sick and taking time away to pray. It is in this season of ordinary time that Jesus both tells and shows us how to live. And so it is with us. We tend to mark life by the big events – the births and deaths, the weddings and graduations. Indeed, these things are very important, but it is in the nitty-gritty of every day existence that life gets lived. Life is full of ordinary moments – of preparing meals, and doing laundry, cleaning up messes, going for walks, holding a child’s hand, planting flowers, going to work and coming back home. We are often so busy waiting for the next big event, that we miss the importance of the every day moments. The big events may frame our lives, but it is the smaller moments that give it its color. If we pay attention to those ordinary moments, we just may find a few miracles mixed in. It is in ordinary time that our children grow and change and learn new skills. It is in ordinary time that love between spouses deepens through the small kindnesses shown to each other. It is in ordinary time that the older generation shares its hard-earned wisdom and tells stories of days gone by. It is in ordinary time that memories are made. It is in ordinary time that our spiritual life is developed as well. While Advent and Christmas, Lent and Easter provide a special opportunity to deepen our prayer life and our faith, ordinary time tests our commitment. Do we remain faithful when we aren’t in crisis or celebration mode? Do we turn to God only in our hour of need or do we make time for God on a regular basis even when life is just going on one day at a time? Ordinary time is full of promise. Every moment is graced by God. We need only pay attention to agree with Phyllis Tickle that ordinary time isn’t ordinary at all. It is good to remember that the Lord is kind and merciful. Yes, God holds us to a high standard. God wants us to love our neighbor and follow the commandments, but when we fail, He is always ready to forgive us. The Lord is kind and merciful. We must never forget that. There is nothing that we have done that is so bad that God won't forgive us if we are truly sorry. A little over a month ago, David's 1st grade teacher sent home a letter telling us that she didn't feel David was going to do well in 2nd grade. He was doing fine academically, but new tasks are hard for him at first and he gets easily frustrated. He also tends to cry easily. Now, David has always been a high-stress child, resistant to change. When he was a baby, he used to hold on to his head and cry. I have no doubt when he was born, that first cry meant "I'm not happy! Put me back in right now!" But the thing is, he has really made tremendous progress since then. Yes, he continues to get stressed out easily, but nowhere near as much as he did at age 3. He has actually had a very good 1st grade experience. His teacher is kind and understanding. He doesn't cry in the morning about going to school like he did in Kindergarten. I also understand that in a class of 18 kids, his teacher doesn't have the time to work with him to try to have him cope with his anxiety. I know 2nd grade, where the work load doubles and the teacher is not quite as understanding, would be that much harder. Still, the letter came as a shock. I felt like I had been kicked in the stomach. We were all set for next year - David was going to 2nd grade and Isaac had passed his test to skip Kindergarten and go to 1st grade. Now, we weren't sure what to do. So, I did what I always do when faced with a life-changing decision - I started praying, in this case, a 54 day Rosary Novena. I prayed for David to do well in the remainder of first grade and to make the right decision about whether to home school the boys for next year or leave them at school, and to have the courage to live with whatever decision we made. I have to say, my prayers have been answered. David is doing better in school. I set up a chart for him at home where he gets a sticker for every good day he has in school where he cooperates and doesn't cry. So far, only one day he came home and said he didn't deserve his sticker. His teacher even sent home a letter last week saying that he has been doing much better. I was so happy to hear that. I hope that it will continue. We also made the decision to home school next year. I had seriously considered homeschooling before David went to Kindergarten but decided to try the traditional route. I had tried contacting homeschooling groups at that time, but everywhere I turned I met up with dead ends. This time, all the doors have opened amazingly easily. I have joined a Catholic homeschooling co-op which meets right in the city I live in. It meets on Mondays. I will also be attending a homeschooling function on Thursdays in which the Moms do Bible Study and the kids get to play. I already know two of the families that take part. I am thrilled that both the boys and I will have social outlets. I was just filling out my paperwork to enroll the boys in Kolbe Academy. I like that they provide a classical curriculum and that the boys will still get a report card and a permanent record, and should we continue homeschooling, an 8th grade and high school diploma. It provides accountability both for them and me. I also got the courage I needed to face the principal, especially since I currently work in the school that my children attend. He called both my husband and I in for a meeting to discuss his "concerns" about our decision, but I showed him the letter that the teacher had sent and he understood the reason for our decision. The meeting really wasn't that bad. We also plan to continue to support Catholic education. My husband has just taken over running Bingo for our parish which provides money for the school, and we will continue to support them financially as well. Both the boys and I are excited about next year. It isn't necessarily a "forever" decision. I'm sure that there will be days next year that I will be pulling my hair out and wondering if I made the right decision. But, I'm about 99% sure that I did. I think this will be a very interesting new chapter in our lives and I feel more at peace about my children's education than I have for the past two years. When my homeschooling friend, Karen, who has been a tremendous help to me through this whole process, asked her Bible study group to pray for me before I had to go face the principal, the other woman I knew there said that from the first time she met me she always knew I would eventually home school. Karen said she knew it, too. This is something God has been calling me to do for a very long time. I was just very slow at saying "yes!" Lunch with Another "Catholic Mom"
The columnists for Catholic Mom are from all over the USA. Pat Gohn and I, however, both come from Massachusetts - her from the eastern part of the state, me from the west. Today, however, she was kind enough to make the 2 hour drive so that we could get together and have lunch. Working via the internet as I do is great, but it is also wonderful to actually meet the people who do the same sort of work I do and are engaged in the same sort of ministry. We had a very pleasant lunch! She was even nice enough to buy a copy of my book, Letters to Mary from a Young Mother , so that I could sign it for her. Hopefully, we'll have a chance to do it again sometime. ..Donations (incl. PayPal): ..,Click Here..
Sara Peterson wrote a great article for Catholic Mom on NFP - does it work? In it, she wrote that it is possible to learn NFP while staying at home which is a great option in areas where teachers are not readily available or it is difficult to get out of the house due to taking care of children. The Billings Method of NFP can be learned entirely from home via the Internet Teaching Service available at http://www.woomb.org and the Symto-Thermal Method can be learned through the Couple to Couple League’s Home Study Course available at http://www.ccli.org. This guest post from Heidi Hess Saxton hit a chord with me because my in-laws aren't Catholic. My husband was raised as a non-practicing Protestant. Thankfully, they didn't give him a hard time when he converted to Catholicism before we were married. My mother-in-law has returned to practicing her faith and now attends a Presbyterian Church. She has willingly attended our children's baptisms and Christmas Eve Mass each year to see them in the Christmas pageant. I truly appreciate her willingness to do that even though it might make her feel uncomfortable. Religion is one of those things that we just don't talk about, however, and that does manage to keep the peace. I don't think that my children have realized yet that their grandparents aren't Catholic. This would be a very different story, however, if I had been the one to change my faith and reject my parents' faith. I can't even imagine how difficult that would make life with my mother. And so, I admire how Heidi handled herself in this situation. I'm sure that I wouldn't have done as well. My parents were visiting with us this week. Dad put in the dog fence (thanks, Dad!) ... and Mom roped me into one of "those" conversations. You know the kind: high in drama, low in resolution. This time, the subject was Catholicism ... my practice of it, to be precise. I've had six years of intensive formal faith formation ... but because in her mind I've rejected everything she taught me, she can only conclude I've been "brainwashed." She accused me of considering her a pagan going to hell because she's not Catholic (where she got that, I have no idea). Yet clearly believes that the only reason I have any chance at heaven at all is because at one point in my childhood I prayed the "sinner's prayer." Not because I'm a Catholic Christian ... but despite it. *Sigh* "I never said you were a pagan, Mom. I never even thought it." "You say it all the time, with your actions! You wouldn't even go to church with us at Easter!" And there it was. For her, the fact that I won't take my kids to their church when we visit them, or at the very least insist on finding a Catholic service that we can attend in addition to theirs, is proof positive to them that we consider ourselves better Christians than they are. "It's not that we're better Christians, Mom. It's that I need all the help I can get to stay spiritually strong ... and the Catholic Church is the only place I can receive the Eucharist. It's the only place I can be part of the one, holy, Catholic, and apostolic Church founded by Christ." She rolled her eyes. "By what you do, you are teaching your children that Grandma and Grandpa aren't real Christians." "Actually ... by not taking them to your church, especially when you have a communion service, I avoid having them asking questions about why you aren't Catholic. They notice stuff, Mom. They see that you don't make the sign of the cross when we say grace. They wonder why you aren't as excited as we are about Christopher receiving the Body and Blood of Christ. They want to know why Jesus isn't present in the tabernacle at your church, as He is at our church. They notice everything. I tell them that you are Christians, but not Catholic Christians, and we pray for the time when we can all go to church together ... in the Catholic Church." "So you DO think you're better Christians than your father and me." "Not better Christians ... just Christians who have access to graces that right now you do not. I'd be so happy if one day you would look more into the history of the sacraments, and let yourself consider what Jesus meant when He said, 'Unless you eat my flesh and drink my blood, you have no life within you.' I know how much the sacraments have changed my life ... and I think they would bless you, too." "I don't need sacraments. I have my faith. I can read the Bible for myself. I didn't raise you this way ... and I'll never understand why you felt the need to forsake your spiritual roots." A light hit. "Mom, how did Grandma feel when you decided to stop going to the church you were raised in?" "It's not the same. I didn't have a personal relationship with God until I was in my thirties. I was baptized in Grandma's church, but I didn't know God." "I met God in a profoundly personal way in my thirties, too ... through the Church. I came to know my brothers and sisters in faith -- all the saints in heaven. I came to understand that I have a spiritual mother who loves me and prays for me in heaven, just as you do here on earth." (I knew I was treading dangerous waters here, since Mom has told me how hurtful it is that I consider Mary my mother.) "And just like you, Mom ... I'm trying to raise my children to love God and serve Him with everything they have. That, I got from you." She sniffed, considering this. "I do get a kick out of watching you lead VBS and doing all the arts and crafts I used to do when you were little." "You were a great Sunday school teacher. You understood how important it is to be consistent with kids, to keep things simple and straightforward until they get older and can handle more complex issues. You brought us to church every Sunday, because Sunday is God's day. "And that is what I'm doing with my kids, too. We go to church ... to our church ... because that is the faith we are practicing. We go to that church because, as Catholics, we are obligated to go ... and, because I want to be there. It's not that I don't want to be with you during that hour. It's that I have a higher responsibility, one that I take very seriously. "Mom, I want you to know that I understand that you don't feel entirely comfortable at Mass, and that if you decide to go to your old church when you're visiting us, I won't be at all offended. If it means that much to you, I'm even willing to go with you to your church, by myself, on a Sunday when your church isn't serving communion ... so long as you don't give me a hard time about going to a second service to fulfill my obligation to God." This was how the conversation ended. It's not ideal, when issues of faith divide families. God intended religion to unite people, to draw them closer together as they approach transcendent reality together, on their knees. And I suppose if we were all completely rational about it, and worked hard to understand each other's sensitivities and needs, the differences wouldn't hurt so much. Then he said, "If I find favor with you, O Lord, do come along in our company. This is indeed a stiff-necked people; yet pardon our wickedness and sins, and receive us as your own" (Exodus 34:8-9). "Oh, Lord ... come along in our company. Even when at times that company is divided. Even at times when we can't understand each other. Even when at times we find it impossible to get past certain hurts, certain realities, certain conflicts. There comes a time when we have to make allowances whenever possible for the feelings of others ... but we cannot allow those feelings to deter us from doing what is right. And so, today I'd like to offer this prayer for those of us who have family on the other side of the Tiber ... close enough that we can see their tears through our own. From the beginning You created family. From the beginning You ARE family. One and holy Triune God, unify with bonds of love. Soothe angry hearts and enlighten blinded minds. Make us forgiving, consoling, kind. Render us family, just like You. See our pain and pray for us. Send out a miracle of love today. "Copyright 2008 Heidi Hess Saxton (http://mommymonsters.blogspot.com/). Used with permission. All rights reserved." Sometimes it is such a pleasant escape to lose yourself in an easy work of fiction. The Choice by Nicholas Sparks ("The Notebook," "Message in a Bottle") is that kind of book. It tells of the romance between Travis and Gabby, of love found and nearly lost, and the difficult choice that Travis must make. It is a book of hope, and holding on to faith when all seems lost. Any romantic at heart will enjoy this book. Spending time with it is a very pleasant way to spend a day. Fellow Catholic writer Pat Gohn just graduated from the Franciscan University of Steubenville with her Master’s Degree in Theology (Congratulations, Pat!). On her blog at http://writenbtween.blogspot.com/, she has a photo of her dressed in cap and gown, proudly holding her diploma with the caption, “Now what?” I think that almost every graduate can share that emotion. You work so hard for so long to achieve that elusive diploma and then you are faced with an uncertain future. Even if a job is lined up and a five-year plan is firmly in place, graduates tend to have a mixture of both excitement and fear as they step out into the next stage of their lives. Commencement speakers are given a bad rap. Most people don’t remember a thing that they say, and the success of a speech is based solely on how brief it is. Back when I received my undergraduate degree, my commencement speaker was Regina Noonan Hitchery. No, I did not remember her name. I had to go back and look it up. I do, however, remember one thing that she said. She told us not to be afraid to make difficult choices and to take ownership of our lives. As I sat there on that extremely hot May day, I felt rather secure in my choices. I was engaged to be married the following summer and I was headed to the University of Massachusetts to earn my master’s degree in history. While I would get married, the history degree was not to be. I went to UMASS for exactly one day and knew it was not where I belonged. I withdrew before I had to pay anything other than a $5 parking ticket! Everyone I knew thought I was crazy. I actually wrote a letter of apology to the college professor who had encouraged me so much. I was scared and had no idea where the road would lead but I was ready to find out. I worked three part-time jobs for a while, including one working as a secretary in the Continuing Education office at my alma mater, Elms College. They would eventually offer me a full-time job a few months later. That job included the perk of being able to take classes for free. By the following September, I was married and my husband was starting law school. I decided to enroll in the Masters program in Applied Theology. I had no great plan in mind when I did this. It was one of two Masters programs the school offered at the time and I knew I didn’t want the other one. Whenever people asked me what I planned to do with the degree, I told them it was just for me. I just wanted to learn. I took one class a semester for four years. I defended my Master’s thesis when I was eight months pregnant with my first child! I didn’t attend my graduation as my husband graduated the same day from law school. I received my diploma and put it into a box. It was something I had accomplished but didn’t really matter at that point. I was busy adjusting to life with a child! Everything else paled in comparison. I never, ever planned to do anything with that Master’s degree. It wasn’t until over two years, and another child, later that I felt God calling me to start writing about spirituality and faith for other busy women struggling to deepen their relationship with God while taking care of their families. God had a plan all along. He just didn’t let me know what it was until He (and I) was ready. There are still days when I say, “Now what?” There are still difficult choices to make and I never make them without spending a lot of time in prayer. I trust, though, that God has a plan, even when I don’t have a clue. Most of the time, the plan can only be seen in hindsight. So, like Regina Noonan Hitchery, whose words have stayed with me all these years, I encourage new graduates to take ownership of their lives. Don’t be afraid to make the difficult decisions. I would add to spend some serious time in prayer before making them, however. God has a plan for you. You just need to live it. “Down syndrome is the most common genetic condition, happening once in every 730 births. Down syndrome occurs among people of all races and all economic levels and affects more than 350,000 American families.” The sixty-three women who share their stories of raising a child with Down syndrome in “Gifts: Mothers Reflect on How Children with Down Syndrome Enrich Their Lives” breathe life into that statistic. “Gifts” is an amazing book with parenting lessons even for those whose children don’t have disabilities. The stories will open your eyes and touch your heart. It is an invaluable resource for those facing a diagnosis of Down syndrome in their own child. It is a good reminder that we need to live our faith. It is not enough to say "I believe" and go on our way. Jesus instructed us to love both God and neighbor. It is through serving our neighbor that we show our love and faith in God. The two cannot be separated from each other. www.myvocation.com. It is sponsored by my home diocese of Springfield,MA. Something to remember when life is hard. It was a brisk morning with a fog laying over most of the yard. I couldn't resist stepping out of my warm house to breathe in the fresh smells of nature. For many families, mornings are so rushed, I wonder if they ever have time to enjoy all that God has to offer in those early quiet moments before the birds start making their din. Admittedly, you have to get up before, say, 5:30ish, to take it in; most people I know aren't particularly interested in anything at that time of day. But, I am. For some reason, my biological clock has changed and I routinely wake up around 4:30 a.m. I don't particularly want to wake up that early, but, I figure, if God wants to talk . . . If you have been struggling lately with a decision, take some time to really listen to God. If I am trying to listen to God, I'll read something inspiring and meditate on it. As I do this, my concerns seep in and very often a hint of an idea will take shape. The more I consider it, the stronger the impulse to act on it. I have found that this path to God's wisdom has never failed me. Not once. How do you listen to God? Is it working for you? Please visit my website at http://www.janetcassidy.com for more news and commentary, including my blog! May has long been considered a month devoted to Mary. As such, it is a fitting time to explore the four main Marian doctrines promulgated by the Church: Mary as Mother of God, The Immaculate Conception, Mary's Perpetual Virginity, and Mary's Assumption into Heaven. The Doctrine of Mary's perpetual virginity is perhaps the one that garners the most debate. While most, if not all, Christians accept that Jesus was born of a virgin mother, what happened after that birth is not so easily agreed upon. After all, the Biblical record seems to imply that Jesus had brothers and sisters. The Catholic position on this has always been that the terms used for brothers and sisters did not mean an exclusive relationship as we take those terms to mean today – being born of the same mother and father. Rather, in Hebrew at that time, there were no terms for cousin, nephew, or uncle. The terms simply meant relatives or brethren. The individuals referred to could have been Joseph's children from an earlier marriage or cousins. One of the earliest proponents of the tradition of the Assumption was St. John Damascene (675-749), one of the last of the Fathers of the Church. He wrote that “It was right that she who had kept her virginity unimpaired through the process of giving birth should have kept her body without decay through death. It was right that she who had given her Creator, as a child, a place at her breast should be given a place in the dwelling-place of her God. It was right that the bride espoused by the Father should dwell in the heavenly bridal chamber. It was right that she who had gazed on her Son on the cross, her heart pierced at that moment by the sword of sorrow that she had escaped at his birth, should now gaze on him seated with his Father. It was right that the Mother of God should possess what belongs to her on and to be honored by every creature as the God’s Mother and handmaid.” Already in the sixth century, there were liturgical feasts dedicated to Mary. 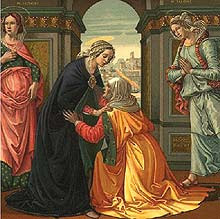 In "Redemptoris Mater," Pope John Paul II reaffirms that tradition, “Preserved free from all guilt of original sin, the Immaculate Virgin was taken up body and soul into heavenly glory upon the completion of her earthly sojourn.” In heaven, she continues to serve, sharing in the kingdom of the Son (RM 41). Heidi Hess Saxton has written a very informative article on a very difficult subject for Catholic Exchange: When Your Child Has Been Abused. As the Child Advocate for my own parish, I am responsible for making sure that every volunteer and employee has training in recognizing the signs of child abuse. It is such a difficult situation for all involved. In this article, Heidi has provided some concrete ways to deal with the unfortunate tragedy of child abuse. When The Gift of Years: Growing Older Gracefully by Joan Chittister made its way to my mailbox for me to review, I wasn't quite sure what to expect. Was I really the right person to be reviewing this? After all, I am in my thirties, transitioning from youth to middle age. I'm not quite ready for senior citizen status yet. As it turned out, “The Gift of Years: Growing Older Gracefully” is a wonderful lesson in how to live, regardless of our chronological age. Chittister, a Benedictine sister, is 70 years old. She suggests that she may actually be too young to write this book because life still has lessons left to offer. 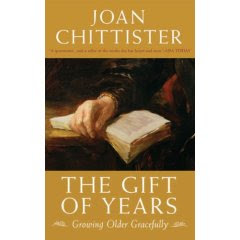 She “reserves the right to revise this edition when she is ninety.” Chittister views how we life at any age to be a choice. We are each given the gift of today. It is up to us what we do with it. She counters the idea that old age need be a time of isolation and loneliness and uselessness. Rather, it can be a time of great connectedness and joy and purpose. It is a time for looking back, not with the pain of regret for opportunities lost, but with understanding of how the life that has been lived has meaning for who we are right now and what our future holds. Of course, there are special challenges that come with the transition to later adulthood and Chittister does acknowledge that fact. It can be difficult to be older in a world that so values youth. It can be hard to reclaim a sense of self with everything that defined that self is now gone. It can be a struggle to cope with physical ailments and disabilities. As Chittister states, however, “there is no such thing as not coping. . . The only issue is whether we will choose to cope well or poorly.” We do have a choice. We can adjust our way of thinking and our way of being or we can give up. Mostly, though, being older brings freedom. “We are free now to choose the way we live in the world, the way we relate to the world around us, the attitudes we take to life, the meaning we get out of it, the gifts we put into it. And all of them can change.” “The Gift of Years” is a gift in itself. It provides the opportunity to reflect on what it means to grow older and provides hope for a time of life that holds great promise. Today is the last day of the "Catholic Writer's Conference" sponsored by The Catholic Writers' Guild" and Canticle Magazine. It really was a great conference. I presented on "The Art of the Blog" and enjoyed conversing with the attendees very much. I also attended many other workshops and got some great ideas for my own writing. I would like to say a very public Thank You to all who were involved in this project from its inception to its final day. Fr. McGivney named "Venerable Servant of God"
I was just reading the May 2008 issue of "Columbia" magazine, and learned that Fr. Michael McGivney has passed the first step en route to sainthood. This comes 10 years after his cause for canonization began in October 1997. Fr. Michael McGivney (1852-1890) was the founder of the Knights of Columbus. For those of you who haven't done so, I would encourage you to read Parish Priest: Father Michael McGivney and American Catholicism by Douglas Brinkley and Julie Fenster. It is a wonderful story of Fr. McGivney's life as well as a look at American Catholicism at that time. The title "venerable" means that Fr. McGivney can be held up as a role model of what it means to live a Christian life. A little girl woke up with a bad dream. Her mother attempted to comfort her by reminding her that there was nothing to be afraid of because God was with her. The young girl replied, "Oh, I know God is with me, but I need someone with some skin!" This is true for all of us, isn't it? We know God is there, but we also need the signs of God's love that come from other human beings. We, too, need someone with "skin" to offer encouragement, to give us a hug, to physically help us when we are struggling, to hold the door open, to help us carry a burden (both literally and figuratively.) By the same token, we need to be a sign of God's love for those we encounter on a daily basis. We need to be the one offering our help and support and our concern. A Church I pass on a regular basis has the words "I have no body now but yours" written on the outside. How true that is! We need to remember that we are God's "skin" in the world. For those of you who publish blogs or websites, you may have seen the ads for a new system promising that you can make millions of dollars by getting Google Ads free. It sounds too good to be true, right? Yet, it is tempting. The "secret" is being offered in different places for prices ranging from $60 - $100 - not too much of an investment if you figure that you can make millions off of this idea. I admit, I was tempted. It took quite a bit of searching but I was finally able to discover what the "Secret" is. It isn't so much a scam as it is misleading. You don't get the ads for free. Instead, what you do is offset the cost of your ads by selling advertising on your own site. If selling advertising on your own site was that simple, there would be no need for Google Ads in the first place. There really isn't any foolproof way to make money on the internet. It is a business like any other, but there will always be people willing to fork over their money for a chance at easy money, especially when they are desperate. I thought I would save you the trouble. This verse from John's Gospel for today is so comforting. Jesus knows that this life is not always easy. It often seems as if evil is winning. But Jesus reminds us that while battles may be won or lost, the triumph of good over evil is certain. Spring seems to be a special time for miracles. After the cold and desolation of winter, everything comes to life again. We are surrounded by miracles and, yet, we so often don’t stop to appreciate them. Daffodils and tulips are blooming in my garden. Planted in the fall, they are my act of hope each year that I believe spring will come. As winter is just drawing to a close they begin to poke their heads up out of the snow, holding such promise. Then, one day, they begin blooming and it is breathtaking. Each flower is so beautiful. It lives for only a few short days, but God cared enough to put such care into its creation. The same goes for all the other green things that are pushing their way through the earth, reaching up for the sun. My children love to collect the dandelions and present them to me so that I can put them in vases. I did the same thing when I was a little girl. Even the so-called weeds are made by God! This morning at mass, the children of our parish took part in the crowning of Mary, a special tradition in the month of May. The 2nd graders who made their first communion this weekend were dressed in their special first communion clothes, a symbol of their purity as they received Jesus for the first time. Each child was given a blue carnation which they placed at the feet of a statue of Mary while “Hail, Holy Queen” was sung by the congregation. It was so touching. Each of those children is a gift from God, each one created for a special purpose, each one a walking miracle! This afternoon, my children were playing with the little girl who lives next door. They were all blowing bubbles and having a wonderful time doing it. I watched the bubbles as they sailed away. The light was streaming through them and making little rainbows. They only lasted a few moments but they brought such delight for that short period of time. We have a God that made rainbows! It amazes me that anyone can look at creation and not believe in an intelligent, loving God. How could all this be random? From the tiniest part of a cell to the expanses of space, such care was put into creation. So often we are in a hurry. We get caught up in the busyness of life and we walk right by. We get mired in sadness and discouragement. We see all the darkness. But we are surrounded by beauty. Our world is overflowing with miracles! Somehow they are all that much more noticeable in the spring. Each flower, each insect, each sunny day, each time our children laugh playing outside is a reminder to take notice and to thank God. Today is the day to pay attention to the miracles that surround us. I had the chance to experience many moments of beauty the past couple of days. 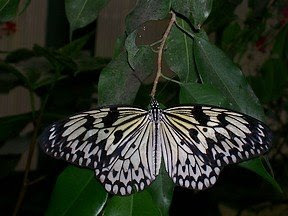 Yesterday I went with Isaac's class to Magic Wings Butterfly Conservatory. The butterflies and their surroundings were breathtaking. Today, the kids went to the circus with Grandma, and my husband and I went to an art show at the Indian Orchard Mills. It is an old mill converted into studio and gallery space for many artists. That in itself is a beautiful thing - making use of a building that would otherwise simply serve as a reminder of industry and jobs that no longer exist. I saw many great works of art today, but my favorites were by Heidi Coutu/ Her work was amazing, and far, far out of my price range! That's OK. I can still look and appreciate! I had a wonderful treat when I went to my P.O. Box today. Waiting for me was Donna Marie Cooper O'Boyle's latest book: Catholic Saints Prayer Book . This is a wonderful little book, perfect for carrying in your purse or briefcase so that you can pull it out whenever you need some heavenly intervention. Cooper O'Boyle profiles 32 well-known saints and includes a prayer to each one. There is a remarkable amount of information packed into this book's 80 pages. It is like having a collection of holy cards that you can easily carry with you. "Ultimately, we should see the saints as models of sanctity for us to imitate, as well as tremendous intercessors, helping us when we invoke them. . . Let us invoke the saints often, asking for their holy assistance, even praying along with them, striving to imitate their virtues while praying to become saints ourselves. In doing so, we hope not just to make it to heaven one day, but rather to bring countless souls with us because of our life and how we have loved." The Catholic Saints Prayer Book can certainly help us on our journey to holiness.